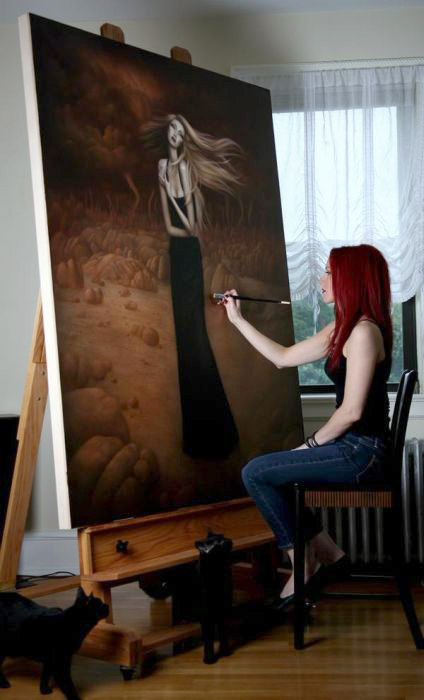 Lori Earley was born in Westchester County, New York in the small conservative town of Rye. She was raised in a very unartistic household; her father was a police lieutenant and her mother was an administrative assistant. Despite not being exposed to the arts, Earley instinctively began drawing as soon as she learned how to hold a pencil in her hand and spent almost everyday of her childhood passionately drawing and painting. The absence of artistic influences and artistic nurturing, however, did not stop Earley's vivid imagination and her creativity somehow continued to flourish from within herself throughout the years... essentially developing her artistic style in a “vacuum” so to speak. Looking back at this situation, most art critics agree that this was perhaps a good thing because it allowed Earley to develop her own, purely unique style, untouched and uninfluenced by anything else or any other artists. Earley studied at the School of Visual Arts in New York City, graduating at the top of her class with a BFA. When she emerged on the art scene a few years after graduating from SVA, Earley's paintings and drawings were so unique that she was quickly acclaimed as an exceptional new talent, praised for her rare, signature authentic portraiture. Her stylized, elongated subjects echoed Mannerist elements and the dramatic lighting of the Baroque period. Her eccentric, accentuated realism drew attention from galleries, established artists and collectors, which immediately propelled Earley to the forefront of a burgeoning art movement. Her recognition as a leading female contemporary master painter grew internationally and moved Earley into the celebrated realm of solo exhibitions in New York City, Seattle, Los Angeles and London. “In an art movement that has managed to juggernaut to such a size and scope that it encompasses a virtual golden age of artistic talent, it takes a lot for a particular artist to stand out as a shining star of an art scene, yet that is what painter Lori Earley has managed to do in a relatively short time” - Hi*Fructose Collected 2 book wrote. Unfortunately, at the height of her success, Earley was diagnosed with a rare genetic connective tissue disorder called Ehlers-Danlos Syndrome. Ehlers-Danlos syndrome (EDS) causes faulty and weak collagen, which is essentially the "glue" that holds the entire body together. After almost having lost her life due to complications from her Ehlers Danlos Syndrome, Earley was then forced to take an unwanted hiatus from her art and spent the next several years having many corrective surgeries. Throughout that extremely difficult time, Earley remained active on social media, raising awareness for Ehlers-Danlos syndrome and giving strength and inspiration to those in similar situations. Although Ehlers-Danlos syndrome is a life-long, chronic degenerative disorder with no cure or treatment, Earley still remains optimistic and more determined than ever in hopes that she will paint again one day. She is currently doing everthing she possibly can to help improve her condition with the help of a special team of doctors at the Mayo Clinic in Jacksonville, Florida and is also planning on writing a book about her unique life story in hopes to inspire others. With her never-ending fighting spirit, Earley's strength and determination continues to be an inspiration for others. Her fans and the art world patiently await her return. Lori Earley painting The Pinnacle, 2008 with kitties Jade and Dez. Earley's work has appeared in NYArts Magazine, The New York Post, The New York Sun, Hi Fructose Magazine, WeAr Global, Magazine, Bon Magazine, Fefé Magazine, Juxtapoz Magazine, Elegy, Rojo Magazine, Direct Art Magazine, Traffic, Fine Art Magazine, Bizarre Magazine, The L Magazine, Home and Garden Magazine, Beautiful Bizarre, Bon, Fefe Magazine, Laminate Magazine, Plaztik Magazine, Celtic Family Magazine and Art of England. Copro Nason Book- "A Catalogue Raisonne", Hi Fructose Book Collective II, "Heros and Villains" Book, Metamorphosis 2 Book.